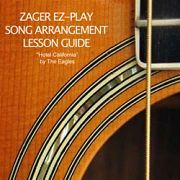 What is the Zager Guitar Video Library? How is Zager Guitar different from other guitar courses? Is this similar to learning from tabs? How many people have learned this way? Will I be able to play any type of music that I want? I have never played guitar in my life...can Zager teach me? I have played guitar over 20 years...what can Zager do for me? Is the Zager System for acoustic and electric guitars? How does this compare to taking lessons at the music store? The Zager Guitar Video Library is an ever expanding online database of video guitar lessons taught by a Master Guitar player that you can view 24 hours a day, 7 days a week, in the convenience of your own home. In these lessons Denny Zager takes your guitar skills to new levels using his world acclaimed "Play-by-Ear" teaching method that revolves around learning to play the guitar by ear. This is the same way many of the greatest guitarists of all time have learned to play....Jimi Hendrix, Duane Allman of the Allman Brothers Band, B.B. King, Eric Clapton, Robert Johnson, Chuck Berry, Stevie Ray Vaughan, Jimmy Page of Led Zeppelin, Keith Richards of the Rolling Stones, Kirk Hammett of Metallica, Kurt Cobain of Nirvana, Jerry Garcia of the Grateful Dead, Jeff Beck, Eddie Van Halen, Ed O'Brien of Radiohead, Ritchie Blackmore of Deep Purple, Pete Townshend, Frank Zappa, Clarence White of the Byrds, Brian May of Queen, The Edge of U2, John Frusciante of the Red Hot Chili Peppers, Johnny Ramone of the Ramones, Peter Green of Fleetwood Mac, Joe Perry of Aerosmith. Instead of endless hours of reciting notes and scales, Denny teaches you how to play the guitar by showing you how to play songs that you choose. Denny’s revolutionary guitar system is similar in it’s simplicity to the paint by number coloring books you used when you were a child. All the spaces labeled 1 you painted yellow, all the spaces labeled 2 you painted blue, all the spaces labeled 3 you painted red, and so on. When you finished painting all the spaces you didn’t know exactly how you did it but you had a beautiful picture that was far beyond your natural artistic abilities. The Zager Guitar system is the same in that it teaches you how to play guitar and sound far beyond your natural musical abilities in an extremely short period of time. The Zager Guitar System taps into that subconscious part of the brain that scientist’s say we rarely use. You may think this is impossible, but after 45 years of teaching and seeing thousands of students achieve it, it happens at a much faster rate than you expect. Most guitar courses are developed by music book publishers that supply you with a one size fits all approach to guitar instruction. They give you a book of chords and scales, a 1/2 hour audio tape, and tell you to “play along” leaving you all on your own trying to figure out everything by yourself. 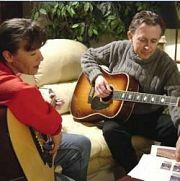 Zager Guitar is different in the way that we provide ongoing one-on-one video instruction from a Master Guitar Instructor with over 57 years of experience. In these full length feature films Denny guides you finger-by-finger, string-by-string, just as if you were in his studio and shows you all the secrets he has learned from playing, teaching, and performing for over 50 years. Regular guitar tabs enable you to play 1-2 parts of a music arrangement at once, supplying you with the basic hand movements of the left hand so you can strum with your right hand. Denny developed his own form of EZ-Play Tablature that make this much easier providing you with full color pictures of your chording hand so you know exactly where to place your fingers on the strings. Zager Song Arrangement Lesson Guides is where the entire system comes together and the real magic begins.Here Denny incorporates the left hand with the right hand which allows you to play 7 parts of a music arrangement simultaneously. No other guitar system in the World can do this. This gives your playing the full, rich, and easily recognizable sound that only the Zager Guitar System can provide. You can see Denny demonstrate this in his sample songs on our Instruction Home page. How many people have learned to play guitar this way? Tens of thousands of players from all over the world have learned to play guitar using the Zager Guitar System and more continue to learn every day. Denny developed his revolutionary guitar system over 40 years ago. By teaching it to so many people Denny has refined the system to what it is today. Professional players call the Zager Guitar System the most innovative guitar learning method since the inovation of the Suzuki method for violin. With the ability to play 7 parts of a music arrangement simultaneously the Zager Guitar System will allow you to play any type of music that exists. Rock, country, pop, folk, classical, oldies, religious, blues or jazz...the method has been tried and tested for over 4 decades with exceptional results. Brand new players do exceptionally well using the Zager System, in many cases better then players who have already taken lessons simply because they haven't picked up bad habits from poor instructors that can slow a new player down. Ask any 20 year player to play you a song using only one guitar and 99% of players won't be able to do it. They'll be able to play you any number of elaborate licks or riffs, which is great if you’re into licks or riffs, but most of us don’t want to hear riffs…we want to hear songs! Many of our veteran players say they have been looking for a system that could do this their entire life and have never found it until now. Besides lessons there are videos on a multitude of topics like certain restringing techniques, tuning, ways to make your guitar play easier, working in bands, and doing live performances, with more videos being added weekly. Is the Zager System set up for both acoustic and electric guitars? You can use acoustic as well as electric guitars, it makes no difference. 92% of guitar instructors teaching in music stores have less than 4 years experience. Denny has to help students all the time whose progress has been slowed or halted because of a bad habit they picked up from an unqualified instructor. Who do you think you are going to learn more from? A 4 year amateur who teaches guitar part time for fun, or a 57 year Master Guitar Instructor who has shown thousands of people how to play the guitar who has dedicated his life to the instrument? 100% risk free money back...no questions asked. Click here to see our return policy.